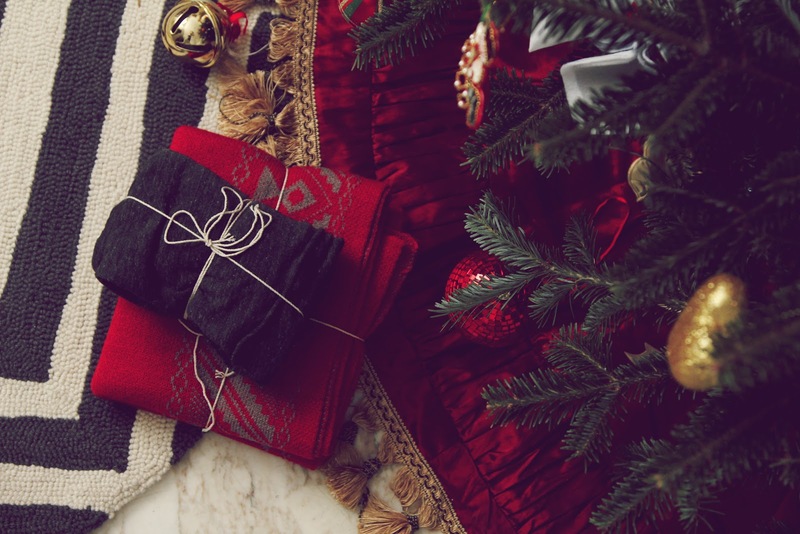 As I lounge around my Christmas decorated house, in this holiday cardigan by Alternative Apparel, I collect some of my favorite accessories for the gift-giving season. Since many are overwhelmed by the process, I wanted to show you what I would consider as some of my favorite pieces to give. Some may ask, why so many accessories? 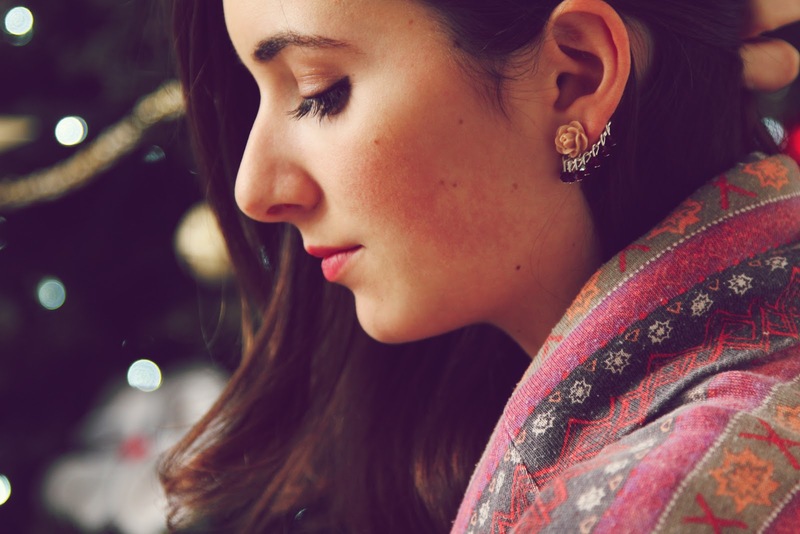 Accessories to me tend to be more memorable, and they are worn more often than a particular piece of clothing. Gadgets are always good gifts, but what's almost more important than the gadget itself? The case you’re going to carry it in. The two go hand in hand, which makes them one item on my favorite holiday gifts list. This case happens to be called The Snugg. 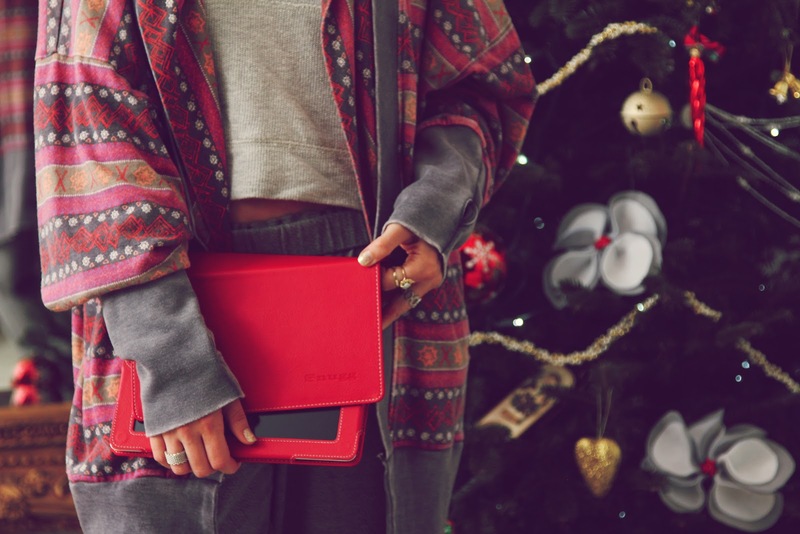 A perfect leather iPad case that is classic enough to be used by both men and women. My dad loves his iPad, why not give him something cool to put it in? One word, trejewelry. I've posted about this up and coming brand during the summer and I will keep posting about them. Whether your style is funk, classic, or bold they've got you covered with these handmade hugger earrings. Definitely the most unique and creative earpiece I've seen in a while which makes them one item on my favorite holiday gifts list. Arm party anyone? Beads are all the rage in the bracelet world, as are the addition of crystal beads for the holidays. 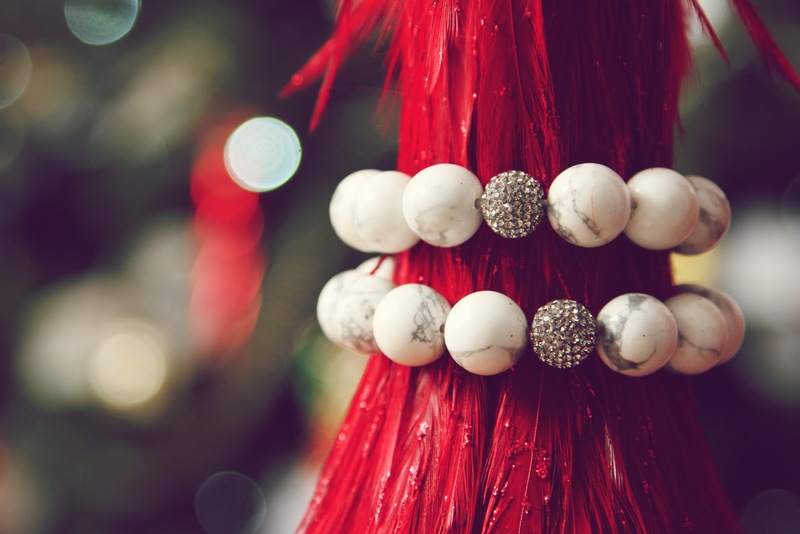 These bracelets are stunning, and I love this marble color especially in the winter. You know me, loving my winter white. Mara by Mara Jewelry offers a range of colors, styles, and sizes of these beaded bracelets. 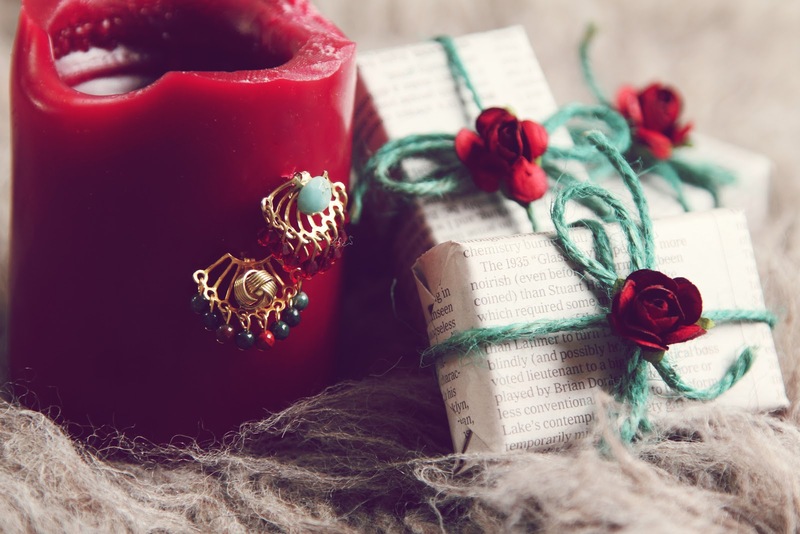 They're easy to mix and match with other bracelets as well which makes them one item on my favorite holiday gifts list. Packaged goods under the tree! One being a lovely red and grey chunky scarf by Spun Scarves, and the other being a super comfortable maxi dress by Alternative Apparel, who would've known?! I love getting great cozy gifts for the holidays. They tend to come in handy for that cold January weather, and keep you looking stylishly bundled. As for the dress, who doesn't need a maxi? Especially one from the most comfortable brand on the planet. 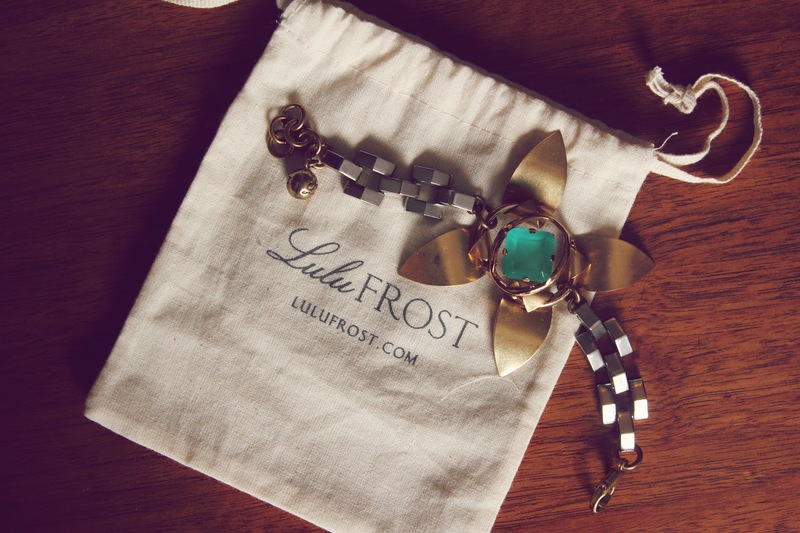 Lulu Frost, for the fashion forward girl who loves her chunky jewelry. Got any friends like that? I do, and I know a lot of people that would drool over a piece like this - aka myself. I picked this bad boy up at the Refinery 29 Tinseltown shop in Soho the other day. Something like this is sure to put a grin on a face during the holidays. Just another piece of my favorite things list! Lastly, these are what I call the chameleon shoes. I say this because they are actually a metallic emerald color, but tend to pick up other colors around them. They are deceiving and I love them. 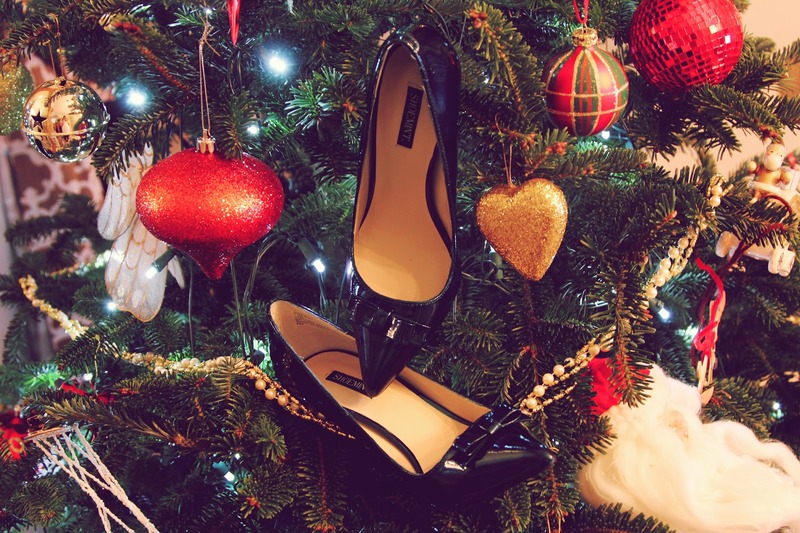 Any shoe lover will swoon at the sight of these pointed toe pumps. Made by Shoemint, these are definitely one of my favorite things.